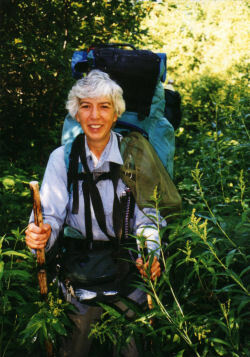 Ellen and I are trying to get back to our excellent adventures. She was gone a lot this winter (to India, actually! ), but now she's back in the groove. Today I'll give you the weirdness, tomorrow the nature. 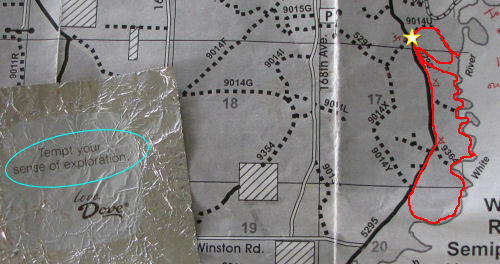 Here's a small piece of the map of the White River Semi-Primitive Area where we went. This is a large section of the Manistee National Forest, about five miles on a side. Its the same area where I helped with the Karner Blue Butterfly survey last summer. First, note the star and the red line. We put the car where the star is, and walked the red line, about 5 miles. Ellen brought us each a Dove candy for dessert, and this wrapper was as good as a fortune cookie. It reads "Tempt your sense of exploration." We sure did. Have you ever been hiking, and needed a latrine really bad? 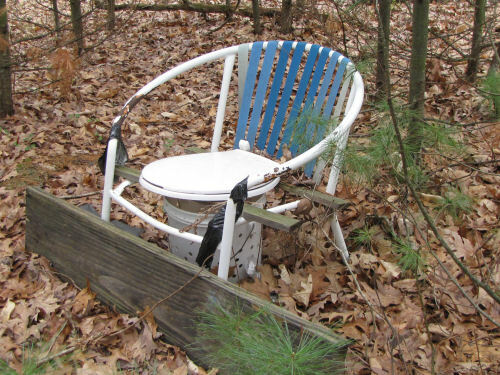 Some of us are comfortable finding a place to go in the woods, but it you aren't... well... someone has provided you with a handy trailside commode. Don't ask me why. I'm only reporting. "Just the facts, ma'am." And Lin thought she lived in Weirdville. Sorry, Lin. I'm placing my bet that I've out weirded you today, sight unseen. I've had the pictures for the next set of letters for quite a while, but it takes a long time to get the pages on my Shark Shots web site. It wouldn't have taken as long, but I decided to make some serious coding changes, and I didn't want to post the second alphabet set without fixing the pages for the first set. I've finally got things to the point where it's not too difficult to make the transition for the old pages. Whew. Anyway, here are five more letters! You seen this one before. If you are visiting nature blogs from the U.S. Northeast, you are probably seeing it everywhere. I'm not going to fight the tide. Why should I, when it's one of the prettiest spring flowers. 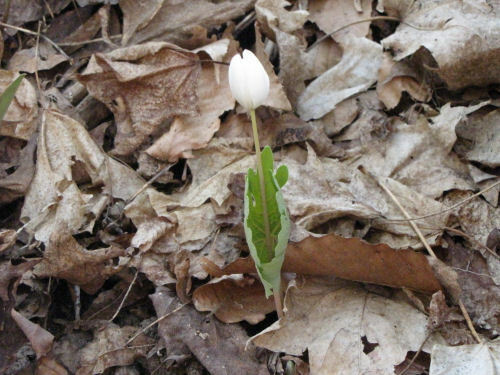 This is Bloodroot, Sanguinaria canadensis. 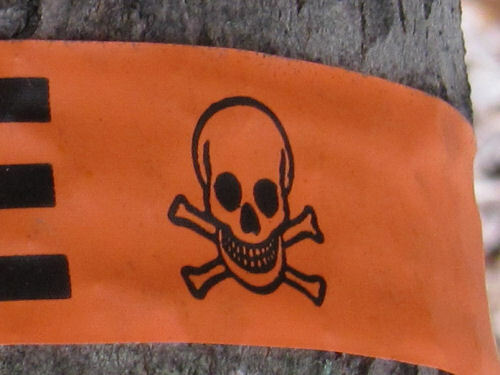 The root exudes a red dye, hence the name. I have a bud for you first. These flowers don't last long, and they don't open wide unless there is sun. 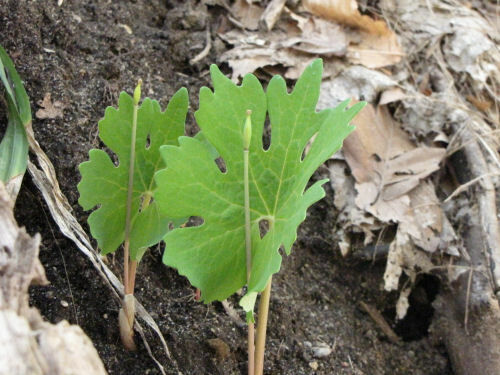 The leaves stay wrapped around the stem, usually till after the bloom is gone. 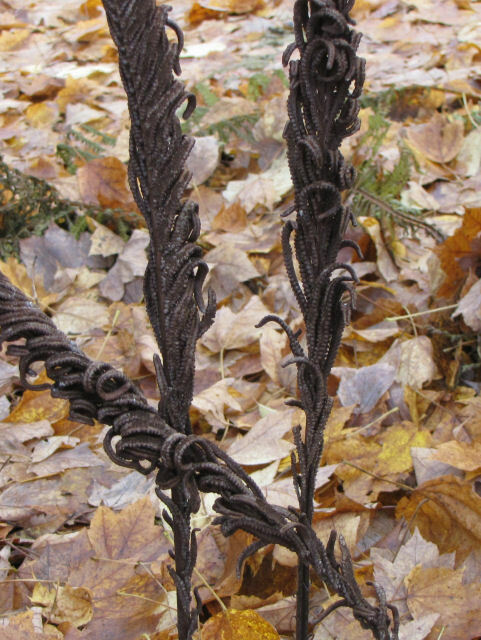 After the flower drops, the seed pod remains, and the leaves open wide. Today, Maggie and I made time for a little adventure. I had one work assignment near this place, and I'd been wanting to explore it for a long time. Since I only had one job, I took a chance and took the dog. It was perfect. No one was home, so I got my pictures, and then we went to the Walkinshaw Wetland. 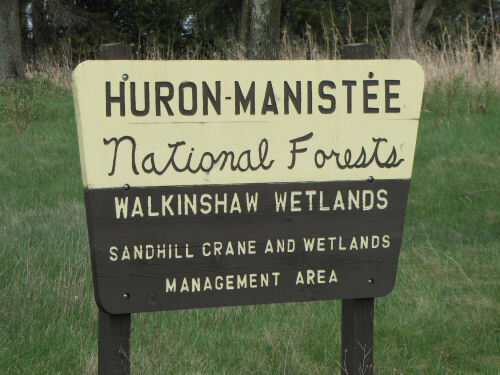 As you can see, it's a part of the Manistee National Forest. That said, the Forest is not all contiguous, and I had no idea of the boundaries of this piece. I should have studied it beforehand, but thought there might be signs. I had no idea if there would be some trails, or what to expect. I'd only driven by it before, and saw a dirt road heading into the area. It turned out that the road was very short and this was the view east from the parking area. If you look toward the back of the picture you'll see some trees on the right and some greening bushes a bit farther left. That's the line of Beaver Creek, although it was long ago channelized, so there's nothing natural about it. 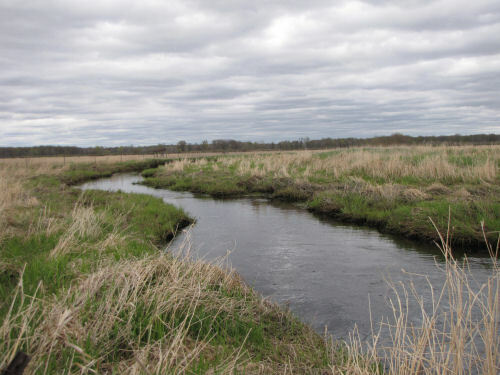 It flows northeast, eventually into the South Branch of the Pere Marquette River. If you've been around this blog very long, that should be a familiar name. Here's the view to the north. There is a pond just barely visible. I wasn't sure if it was part of the public land or not. I thought I heard a sandhill crane when I first pulled in, just one. Never saw it. I did hear a lot of geese. I thought I'd visit the pond. More on that later. First we walked east to the creek. Mostly, it was blocked by a fence, but I did find one place to reach it. It's surprisingly pretty even though channelized. I think it must have been done long ago and has had time to redevelop a few bends. The big bend to the right that shows is just that. The channel does a 45-degree turn and heads directly east. Sorry to kill the "romance." Anyway, we next headed across the field toward the pond. 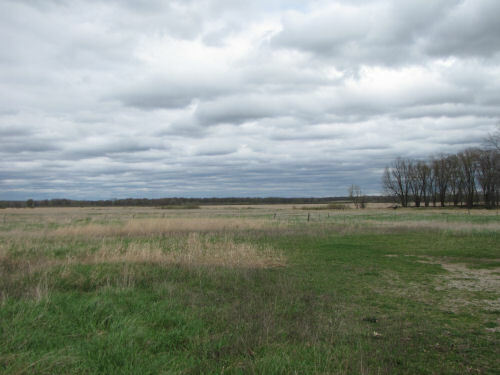 Of course, all that open area is really a wetland. Actually, a lot of it was just difficult walking but dry enough at the moment. At least for a while. Then it got more like this. 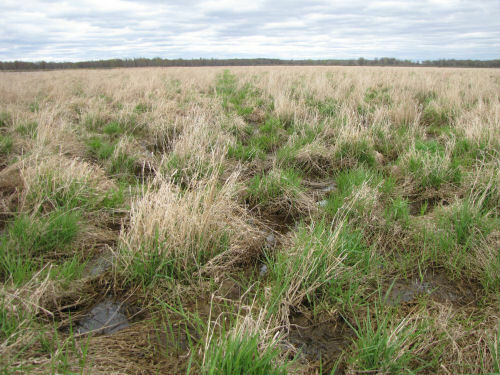 The clumps of grass are called hummocks. The rest is called water. We managed to make it over to the fence that separated us from the pond. I even found an opening in the fence. 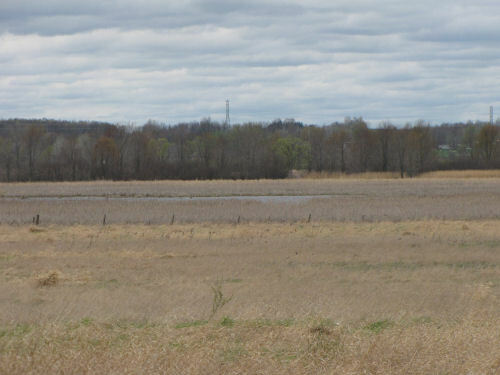 However, if you look back at the pond picture, you can tell there is grayish-brown vegetation all around it. Those are cattails. Cattails grow in... water. No chance at all of getting close to that pond. So we went back to the car. Did we have fun? Sure. Did we have dry feet? No way. I've now looked up the boundaries, and I could have walked much farther without trespassing anywhere. Maybe another time, on a day when the water is warmer! Hey! Did you notice that my counter passed a quarter of a million today? WooHoo! rataplan= the sound of tattoo, such as a drum, horse hooves, or machine gun fire, etc. Whew! Wonder how many of them I'll remember? The ones I SHOULD have recognized are rataplan, attar, anastomosing, and abseil. I knew I'd seen them before, but couldn't remember their meaning. The one I find most interesting is exogam (exogamy), since it's a common concept. It can also be applied culturally or linguistically (oddly enough) where people only marry someone from other cultures, or who speak other languages. If you are worded out, I'll leave you with a graphic demonstration of how the color "apple green" gets its name. Enjoy the lovely baby leaves. It's been a long time since I posted interesting words, and I miss doing it. Looking back, I see that in October 2010 I said I was going to do it every month. So much for that plan. These are all the words I haven't known in books I've read so far this year. (Any book I read that doesn't contain at least one word I don't know drops a point in my estimation.) I like words. Today, I'll list them (in the order I encountered them)... All guesses, funny or serious are welcome. There are too many for me to make up a game with them. I'll bet some of you even know some of the words, especially the ones I've found out are more European. Tomorrow, I'll bring you the definitions. And just for fun, I've added a robin for springtime at the end. Just in case you are curious, the Blogger spell checker program only recognizes 7 of these! And just because I don't want to appear too stupid, I want to say that I know I've seen a couple of these words before, but I couldn't pull out their meaning, so they had to go on my list. Them's my rules, and I'm stickin' by 'em! Sometimes there are so many nifty things from one day that I don't use them all here, and then I can go back and remember them another day. When Loren and I went hiking by the river last Monday we took a route I haven't used in a long time, along the bottom of the bluff. It's usually too wet to walk down there, and I'm more likely to stay along the top. But from down below, the view in each gully, looking up, is impressive. The problem is that one photo just doesn't capture it well. So I stitched together a sort of panorama. It's stark, with no leaves yet, but you can really see the contour that way. The picture is clickable, so you can make it bigger. It's much better that way. Dusty or Rusty or ? I've showed you pictures of the pigeons on the space station (grain elevator) from time to time. These are ordinary pigeons, or rock doves, just like you'll find in any city. Large concentrations of them can be messy, and they aren't popular when they stain buildings and public places. Out here, this small flock doesn't seem to be much of a problem. I continue to be fascinated with the brown and white ones. Although they can have a wide variety of color patterns, most are gray and black, like three of the ones in this group. 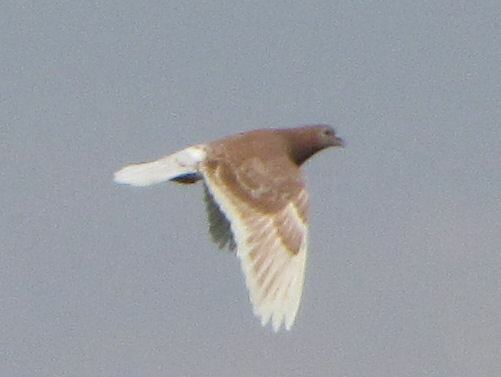 Two years ago, I got pictures of two brown and white ones with really interesting patterns. I nicknamed them Dusty (left) and Rusty (right). 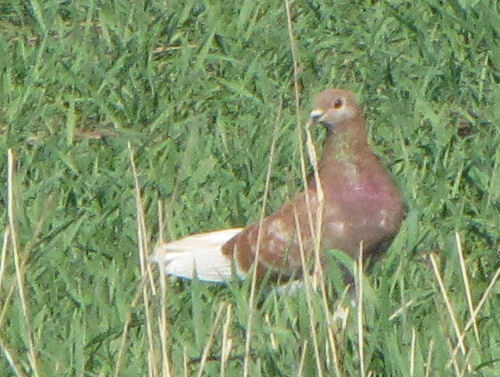 So, when I managed to catch a picture of the one light-colored bird that's hanging out with the group now, I wondered which one it was. First, I saw it on the ground, where they congregate to eat discarded grain. The birds were concentrating on the grain, and I got fairly close before they took off. So, now you can compare their wings. I don't think this bird is either Dusty or Rusty. I found an article that says pigeons live about five years in the wild. 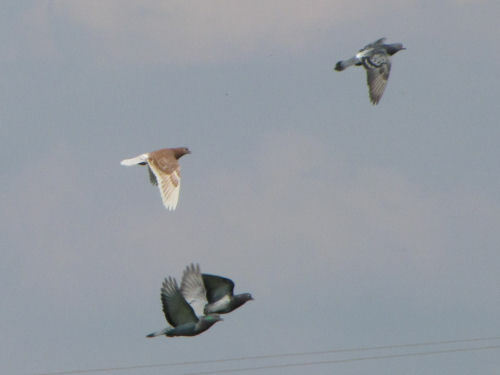 The picture of the other two pigeons was taken over two years ago, and they are clearly mature. Not impossible they are still alive, but it reduces the chances. What shall I name this one? Trusty? Buffy? 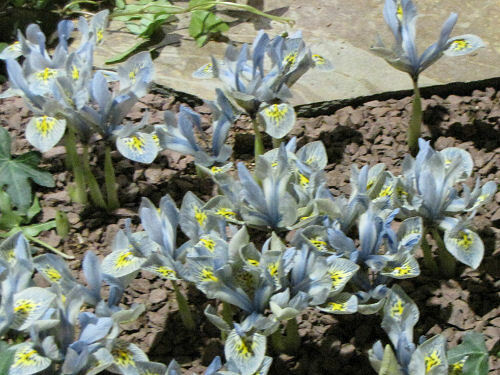 Today I have a wonderful botanical surprise for you, but I also have to make a confession. Confessions first. I saw this shrub on Monday with Loren, and couldn't figure out what it was. I should have known it instantly, but it had been so long since I'd seen any, that I didn't think about it. The joke is on me, because there are dozens of these bushes just a mile from my house, but I didn't know it. I guess I've never been in this exact spot at the right time of year. Just goes to prove that you should never think you know some place just because you've seen it a few times. 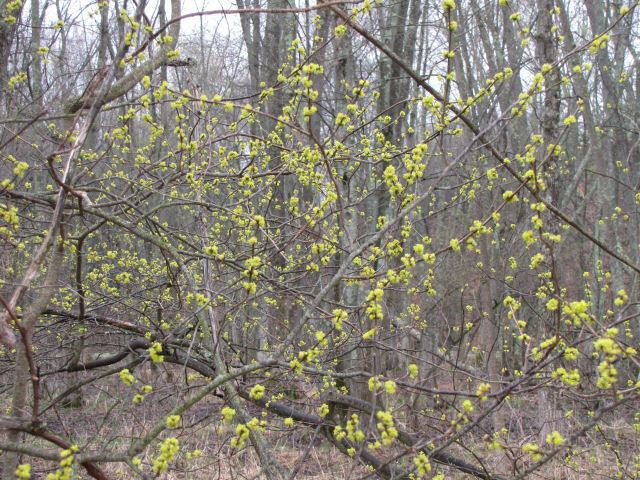 So with no further disclaimers, I bring you Lindera benzoin, Spicebush. 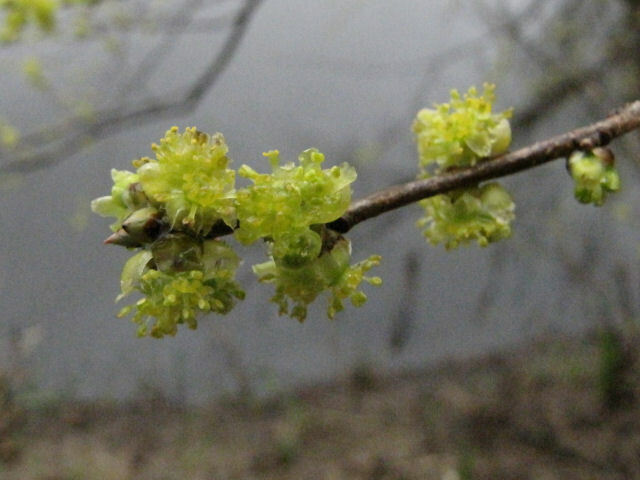 It is the earliest shrub of the spring to bloom, with the small yellow blossoms opening before the leaves. Here's what it looks like from a distance, just a messy bush with small yellow blobs. 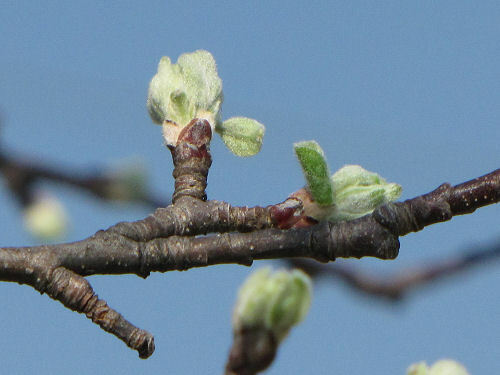 The buds were still pretty tight on Monday, but by today, the flowers were wide open. 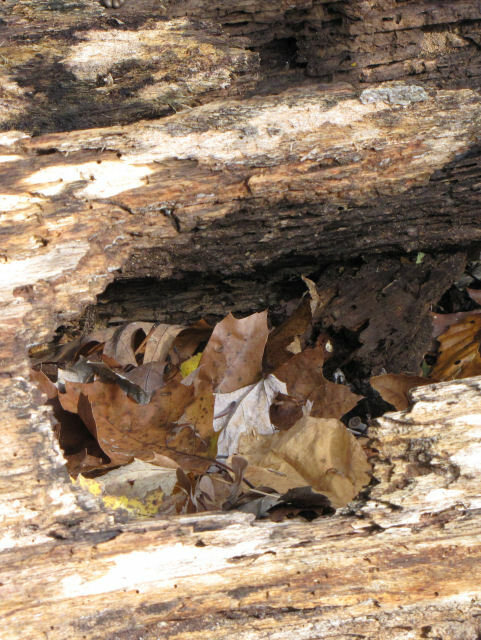 But the thing that kept ringing bells in my head until I figured it out was the spotted bark. 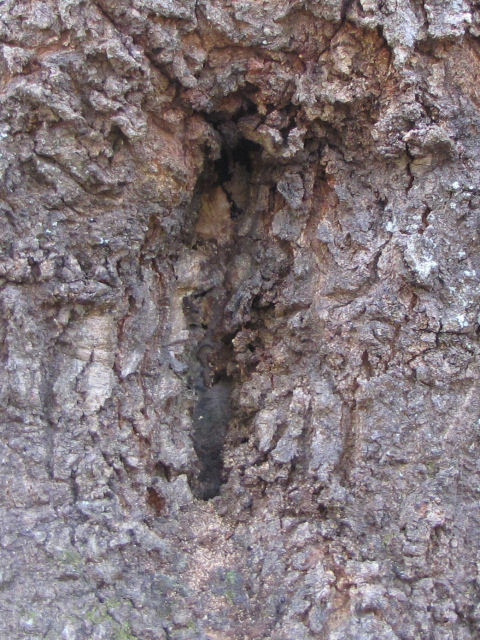 The spots are lenticels, like pores in bark. 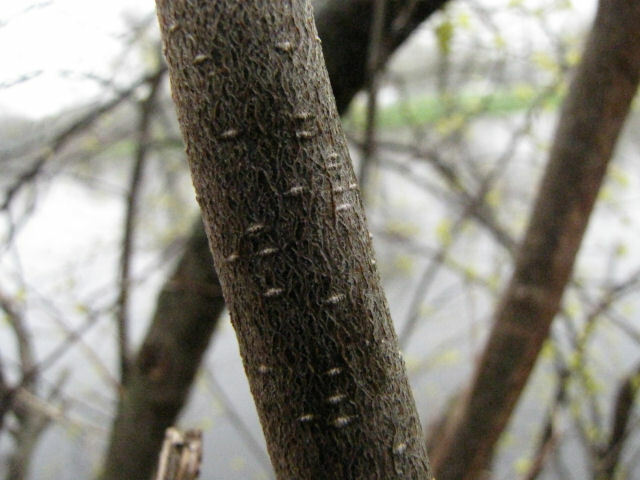 For example, cherry bark is noted for having lenticels that make horizontal lines. White spots were screaming spicebush at me! Finally I heard them. And the spice? 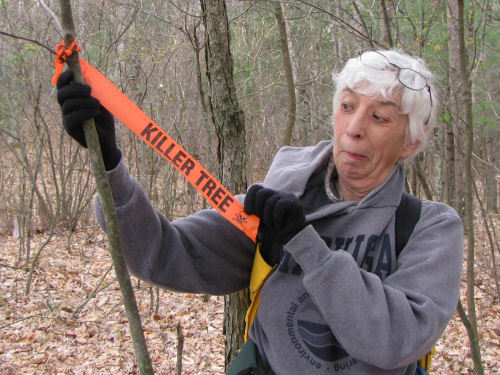 Sorry, I can't provide that for you, but if you break a twig there is a spicy, pungent odor. 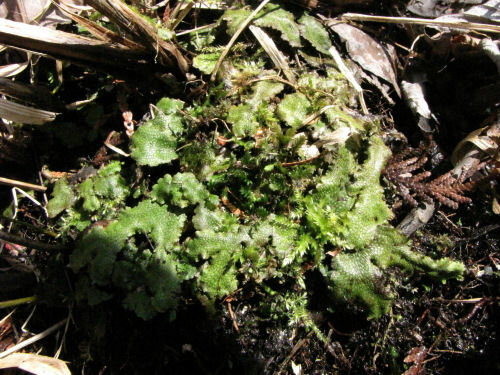 That's what inspired the species name, "benzoin." If you were a member of the Adgitize network, have you noticed changes in the circle of bloggers we frequent since they folded? My traffic is down, comments are way down, and my motivation on my other blogs is lower too. (Adgitize rewarded us for regular blogging.) In all honesty, I'm only visiting blogs that really interest me, not a wide selection from a network. I've found several more nature blogs and a couple of new personal ones I'm reading and commenting on, but if I'm getting return traffic, the visitors aren't commenting. I visit 50 blogs pretty regularly. However, my motivation for this blog hasn't lessened. It's just difficult to find new readers. Entrecard isn't much use these days, either. When I even remember to place ads, they get almost no clicks. Are any of you finding good ways to attract new readers? It's just over a month until my birthday. I'm thinking about another contest. How about it? Would you participate? What kinds of prizes would you like to see? As many of us in the north have mentioned, it's a really strange year! 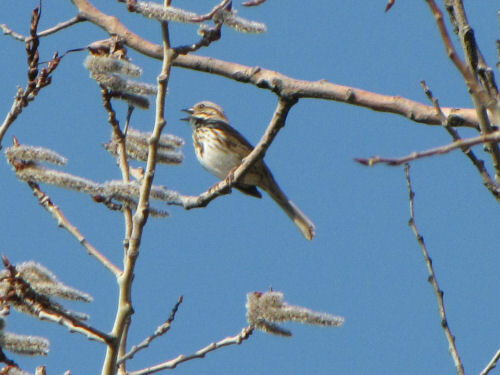 The field is full of song sparrows. 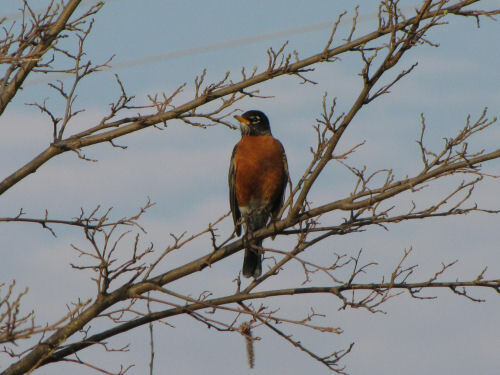 There are usually a few, but right now, that's all I'm hearing- well with the starlings and robins. But no red-winged blackbirds, and no meadowlarks yet. Seems odd to me. 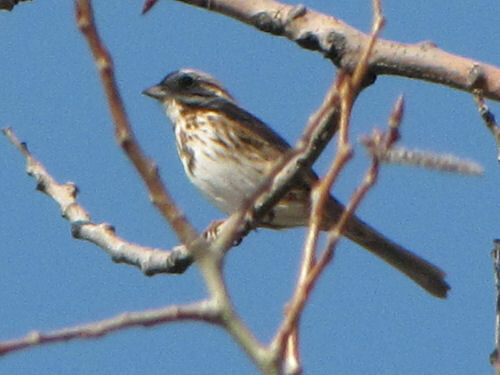 However, you get... song sparrow, Melospiza melodia. The first two pictures I took yesterday. 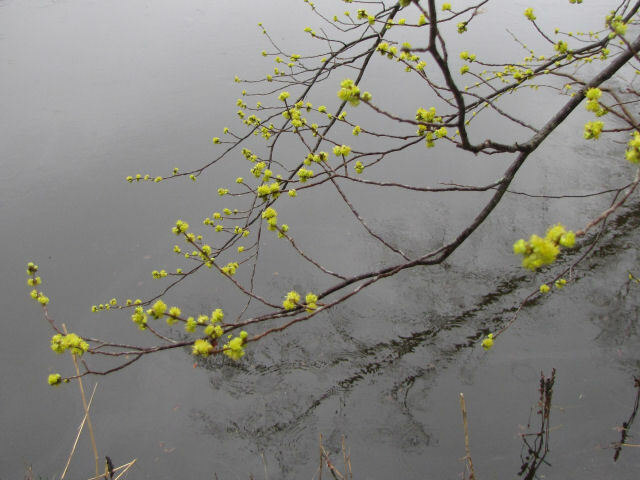 See how the aspen catkins are pointed sideways in the breeze! Except for the shadow from the branch, this picture's not too bad. 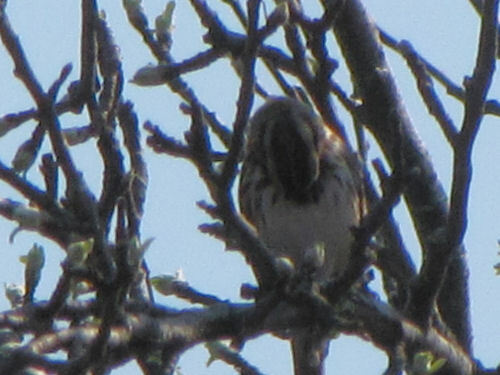 You can see the relatively long tail, gray eyebrow, white throat and striped/spotted breast with a central spot. Here it is singing. Today, I tried to get a recording of the song. I made three tries, and the sounds were a little too distant. Mostly you can hear the wind, and as much as I'd like to share, I don't think it's good enough to tell you much of anything. However, with the lens all the way out, the quality of the images is worse, but you can pick up a few details. 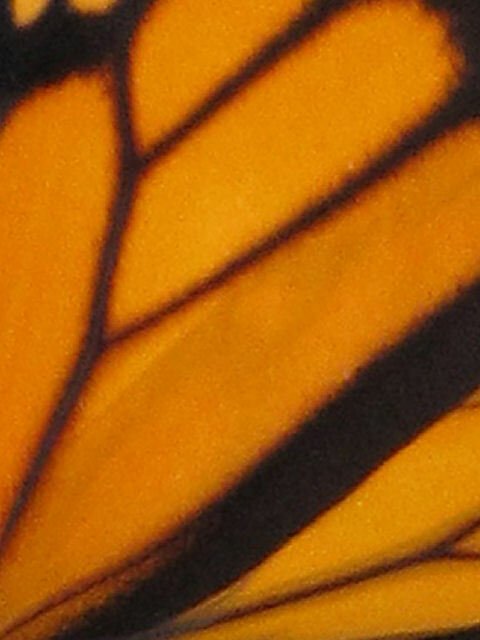 For instance, here you can see the central spot on the breast very clearly! 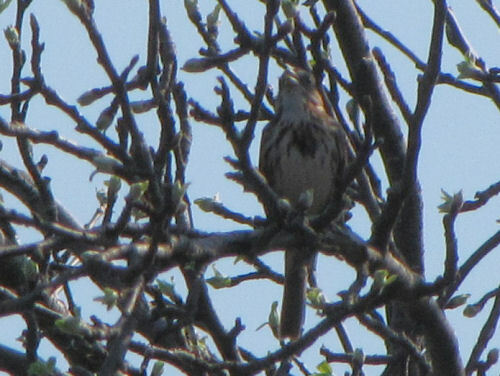 Song sparrows are common around the country, and there is a lot of variation, but they all have some sort of central spot with broken stripes around it. And... it's so important to keep that spot clean! Hope I haven't bored you with a very common bird, but their song is very sweet. The usual mnemonic to remember it is "Maids, maids, maids, put on the tea kettle-ettle-ettle-ettle!" They always make me smile. Such a homey-cottage sort of message. Flowers are blooming and critters are out. These pictures are from yesterday and today. 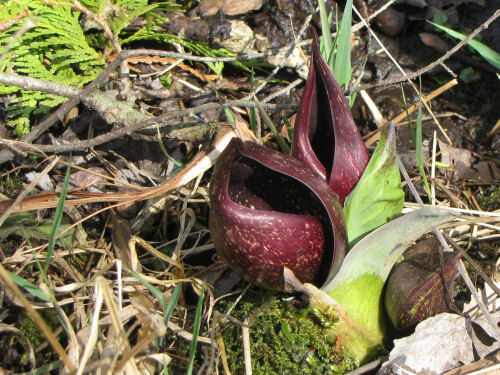 First we have the ever-popular skunk cabbage. It might actually be expected at this time of year. This one is particularly handsome in deep purple. 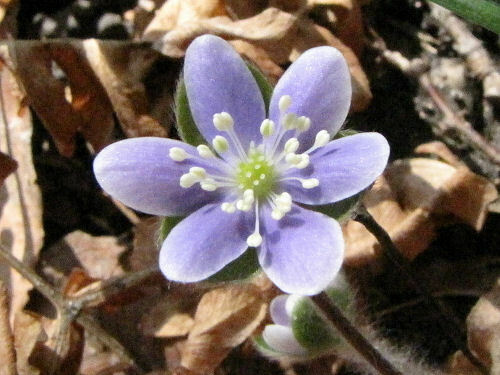 However, the hepatica is about a month early. Last year's pictures show this blooming on April 25. 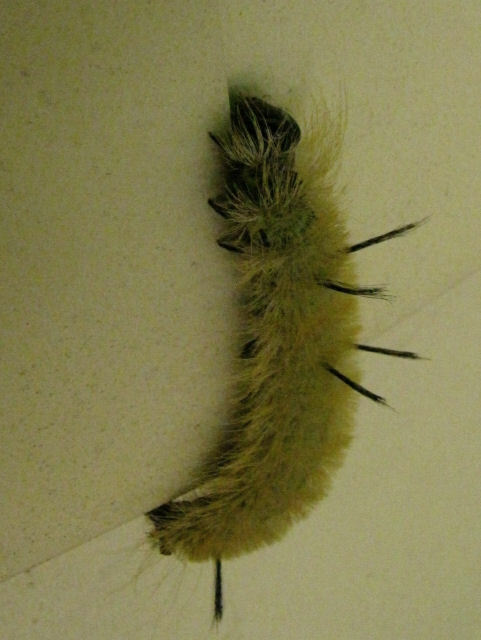 Today, I was lucky enough to spot some critters! 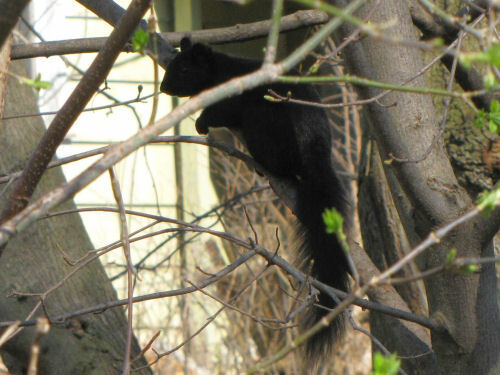 Here's a sleek black squirrel. One might see them even through the winter. 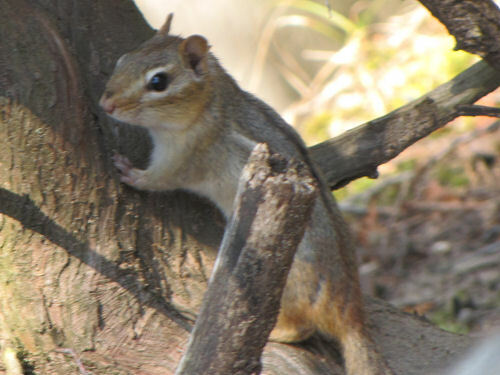 But here's another little Eastern chipmunk. Definitely not seen until the weather warms. I also got some OK pictures of a sweet little bird, but I think I'll save those for tomorrow! Spring is here on the calendar, and on the ground- really strange in March.